Charles Burchell 1870 - 1958. Mr Charles Burchell was my Grandfather. He had five children by his first wife and five children by his second wife, his eldest son was my father, Lawrence. Charles Burchell was a shoemaker and chiropodist working in Waddon, (47 Waddon Road, Croydon), and Thornton Heath, (403 London Road, Croydon). He was one of the few shoe makers who measured, fitted and then delivered to your home, the shoes were made at the rear of a shop/surgery, close to Waddon Bridge. When my Grandfather first traded as a shoemaker his made-to-measure ladies court shoes sold for 2s 9d per pair and his ladies and gents riding boots for one guinea. In 1934 he started Chiropody and had a very modern surgery behind the shoe shop in Waddon and also a surgery in his home at Thornton Heath. The fee for Chiropody then was 1s 6d, a fee which was considered expensive at the time. My, (Michael Burchell), first Chiropody fee in 1956 was 3s 6d for both feet and 2s 6d for one foot trading from a surgery in Fulham Palace Road, which I am still manage but no longer practising from since my stroke in April, 2012. My father, Lawrence, and his brother Ronald, were also shoemakers and repairers. They had a shop in Godstone Road, Kenley near the junction with St James' Hill, just south of Croydon and offered a collection and delivery service for repairs, which was unique, and a definite trade advantage in those days. If you wanted shoes collected you put a sign in your window with a large 'B' on it which they saw from the road and stopped to collect the shoes. 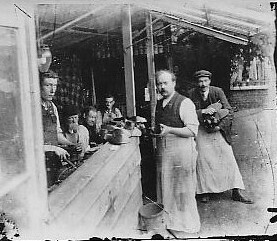 The second eldest son was also a shoe repairer and supplied new shoes trading in Belmont near Banstead. 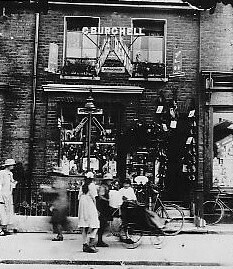 Only one other son of Charles Burchell followed in the shoe trade, and he sold shoes for Lilley & Skinners. The front of the Waddon shop with my father about to deliver shoes on his bicycle. Note the adverts for Dr Scholls, Zinopads and the prices of the handmade shoes. Regretfully the shops are no longer exist. This is the workshop at the rear of the shop in Waddon where shoes were made and repaired. The Grandfather of Michael Burchell is standing in the foreground. The other gentlemen are his employees. This is the van used to collect and return shoes for repair. Customers used to place a sign in their front window with a large "B" on it to signify they had a pair of shoes for collection. 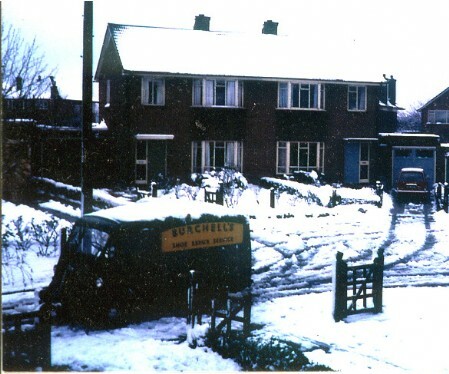 The van came out in all weathers as you can see. This picture was given to us by an elderly patient who found it amongst other pictures.